Depression is extremely prevalent in our society and often under diagnosed. It is fortunate that the stigma attached to it has lessened so that those who are dealing with depression are more likely to reach out for help. The physical health factors influenced by depression are many and can often be extremely serious. I have also been encouraged by some of the research into the successful use of mindfulness and meditation in treating depression successfully being described in the main stream press. For those willing to try a psychological/spiritual approach please read on. Sometimes it helps to know that someone else has had the same experience as you are having and that they were able to get out of the depression. If you are experiencing depression, believe me, I know the pain you are going through. Having experienced severe clinical depression myself for three years and having worked with depressed clients as a therapist for 30 years I believe I have a strong experiential basis from which to describe the way out of that darkness and pain. At the outset of the depression I went to a psychiatrist in hopes that he would be able to help me. He prescribed an anti-depressant and sent me home. After a few weeks life appeared so dark and worthless that I became even more depressed and attempted suicide. I was then hospitalized for two weeks and put on more meds including anti-depressants. The depression just kept getting worse so I weaned myself off the medications and decided to live with the depression without pharmaceutical filters. For three years I lived in the dark pit. Each day spiraling further and further down into the endless darkness. I tried everything to get rid of the depression. Natural remedies, un-natural remedies, prayer, meditation, exercise, travel, spending money and on and on and on. But I just kept going further down into the bottomless pit. Then one morning as I lay in bed I practiced a mindfulness exercise and was examining the depression. All of a sudden it came to me that this darkness was something other than me. That it was, in fact, not me or any part of me at all. My belief has always been that God is All and that God is Love. I do not believe in a separate entity that most religionists call God. I further examined then the darkness that had been overwhelming me for the past three years and asked myself, “If God is Love and God is All then what is this that I have been experiencing”? The thought came to me, this is darkness. Immediately an inner dialog began with a dark ‘voice’ that said, “I am a part of you. I am your other half. Without me you cannot exist. Without me you will die”. This inner dialog went on for about three minutes or so and finally, out of complete desperation I said out loud, “I know you now. You are not me. You are not any part of me and you are not any part of God. So that means that you are a lie and a liar from the beginning. You have been lying to me all my life and feeding on me. No more. You are no longer welcome in me any longer. You are no longer welcome in my life. Your welcome is taken back. I would rather die without you than live with you”. With that it disappeared completely and I felt only bliss. I laughed for a while when I realized that I had always been this bliss and that the darkness I had been experiencing all those years had been an illusion. I had given it power by succumbing to it. By feeding it. The Real me had never been depressed or overwhelmed. For about a year this darkness kept trying to come back. Using mindfulness, internal dialogs and imagery, little by little I kept dissolving it in the same way until finally it was truly gone. I treated it as if it were some sort of metaphorical being or mythological creature. This worked for me. The key to the process that has helped me and hundreds of others with whom I have worked is mindfulness. Once you are able to mindfully examine emotions, beliefs, experiences and your identity you have taken the first step in removing depression from your life. Of course, mindfulness can be used in the same way to deal with stress, anxiety, pain, fear and low self-esteem. Once you are able, with mindfulness, to disassociate from this darkness it is possible to recognize your True Identity and to dissolve the darkness. Of course mindfulness alone is not enough. There are a number of practices and processes that are essential to use in your life on a day to day basis. It is not always easy to dissolve depression, especially when you first begin. Some days are more difficult than others. But with commitment and work you can do it. I believe in using good tools to support your efforts. Learning mindfulness is quite simple. There are some easy and powerful mindfulness exercises presented at this website. Practice them from the first one to the last one. Practice every day. See how you can apply mindfulness in your daily life. If you feel that you need some help or guidance for your mindfulness practice then I recommend starting with Meditation 1 and Meditation 2. You can download them and listen to them in your mp3 player or make a CD with them mp3 files. If you want some guidance with the mindfulness meditations specifically designed to help dissolve depression then you can find those downloads here. Then read the Freedom From Suffering book here, or download it at Light Unlimited Publishing, and practice the suggestions in the book. If you wish, contact me for help and support working through this process to dissolve the depression in your life. Give these specific mindfulness practices a chance to help you get rid of depression. It can work. And remember, no matter what that dark inner voice says, you deserve to have a happy and fulfilling life, you can live without depression and you are not alone. You know anything about anhedonia ? The inability to experience pleasure in anything or just in life in general. Seems my depression has been gone for some time but the anhedonia still lingers on and on, any tips? Anhedonia is usually a symptom of depression so it may be that the depression you were experiencing has just morphed into a different form. Having said that, I will relate to you an experience of my own that may be helpful. After getting rid of the depression that plagued me for so long I began questioning the experience of joy, happiness, pleasure, etc. I came to realize that these ‘positive’ emotions were just the other side of the coin from pain, sadness and misery. To the human mind they are far more desirable of course. I asked myself what would happen if I gave them up as well. What would be left if I did not identify with pleasure or pain. So I began dissolving pleasure, joy and happiness in the same way I dissolve fear, depression, anger and pain. It was an incredibly freeing experience and still is. The result was something it is difficult to put into words. The closest I can come is Infinite Bliss and Love, but those are only words. The experience of ‘positive’ feelings is just as distracting as the experience of ‘negative’ feelings. My suggestion is to use the methods described in my book posted here to dissolve both swings of the human emotional pendulum. Pay close attention to all the emotions you experience and dissolve all of them. Then experience what is left. When you have done that, then dissolve into what is left. Your Real Self is far beyond the dualism of positive and negative, joy and sorrow, pleasure and pain. Try experiencing your Real Self and see what happens. One more thing.. I know you mentioned how shadows express themselves physically sometimes, how does that contribute to fatigue and low libido? Also, will becoming your true self change the way you see the world? Because the way I see it now just seems real dismal and negative. Almost like I’m seeing the world in black and white. Yes, Being and living your true Self will most certainly change the way you see and experience the world. The Real Self is available to you right this moment. It never goes anywhere or hides. If you dissolve those shadows that distract you and then relax enough you will feel it. Then you can just surrender into it and then experience life from that perspective. It sounds very simple and it is. But it is not easy. It takes a real commitment and practice. Feeling the Real Self can take many years or it can take a moment. But know that it is always there and available to you. And when you surrender into it and live it everything changes. 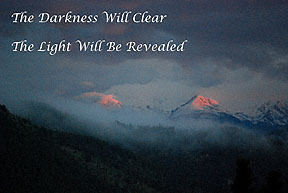 If it helps you can work with the Leaving Behind the Darkness mp3 every day.